SMALL BUSINESS TODAY Launched in March in a Big Way! Find out how we can help your business grow today! With K Business Solutions, Google searches become your fastest leads. Call Small Business Magazine today! So you want to launch a business… Where do you start? You are at:Home»Publisher's Column»SMALL BUSINESS TODAY Launched in March in a Big Way! I have launched a good many magazines titles in my 30+ years in advertising sales and publishing. My career started back in 1979 when I launched the Metro Houston Apartment Guide with Marshall Haas, the founder of Haas Publishing Company. We later launched Perfect Wedding Guides and Jacksonville Communities Guide. Around 1997, I assisted my friend Todd Stigall launch HOMES&LAND Magazine of North Houston and in April 2002, I launched REE Magazine for Sunshine Media. In 2010, I started my own company (with Partner John Cruise) Legacy Publishing Group, LLC which currently publishes Premier Agent Magazine and Profiles Magazine. But, never has a magazine (that I have associated with) launched in such a big way as this publication, Legacy Publishing Group’s SMALL BUSINESS TODAY. On Tuesday evening, March 20th, SMALL BUSINESS TODAY debuted with a “Champagne Launch” at the Marque Houston in City Centre with the magazine’s VIP’s and business leaders from Houston’s business community. Premier Issue clients were in attendance, the magazine’s Publisher’s Advisory Board Members, Editorial Advisory Board members, future cover honorees and other VIP guests were treated to wine, champagne, wonderful food, terrific networking and great entertainment. Farouk Shami of Farouk Systems, Inc (our Premier Issue cover honoree), creator of CHI hair care products, flat irons, etc. was on hand and was presented a cover poster after he shared his thoughts on wealth, success and happiness. The highlight of my evening was when Farouk (just before he departed), shared his compliments on the magazine and validated how needed the publication and its information is to future and current entrepreneurs. Many thanks to our hosts: Josh and Wayne of the Marque Houston for hosting the event. Also many thanks to our “helpers” at the event: Dawn Haynes/Fight or Flight, Eric Kleiman and Steven Magoon event photographers and Vanessa Vara (our graphic designer) for all of their support. It truly was a very, very special event in every way. Many guests wanted to know when the next launch is! Our cover honoree for May is Mr. Hank Moore. Hank, besides being a member of the magazines Publishers Advisory Board, is also our “Chief Advisor”. Hank has been a pleasure to work and it is no wonder that (as someone who has been a consultant, speaker and trainer all over the world), that he has friends and admirers everywhere! In a very short time, I have become a huge fan of his! You will enjoy his story. Well, it is time to let you get started with this very special issue of SMALL BUSINESS TODAY! You Are What I See, or Are You? 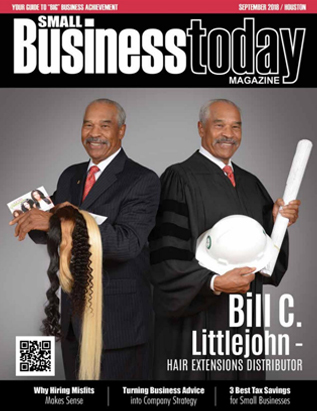 Small Business Today Magazine is a monthly publication as both a glossy, hard copy and a powerful digital (online) edition. The principals of Small Business Today Magazine(Steve Levine, Barbara Davis-Levine, & John Cruise) bring more than 60 years of publishing, marketing, advertising, and small business empowerment expertise to the publication and its support services.